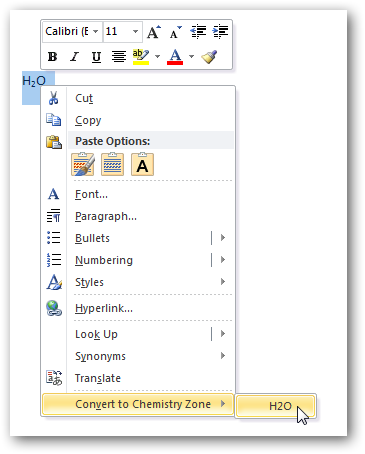 Microsoft Word is a great tool for formatting text, but what if you want to insert a chemistry formula or diagram? 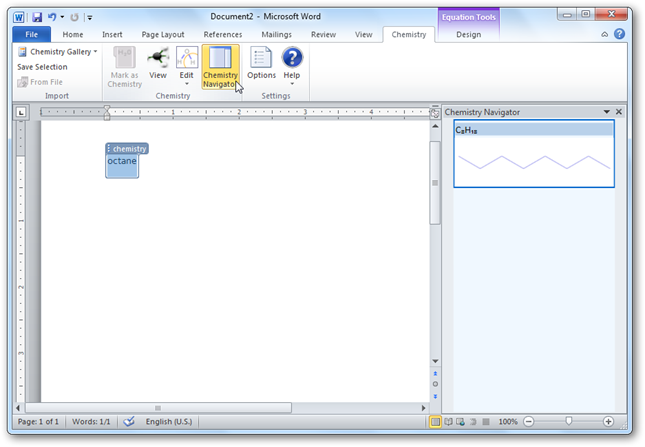 Thanks to a new free add-in for Word, you can now insert high-quality chemistry formulas and diagrams directly from the Ribbon in Word. You can convert any chemical name, such as benzene, or formula, such as H2O, into a chemical diagram, standard name, or formula. 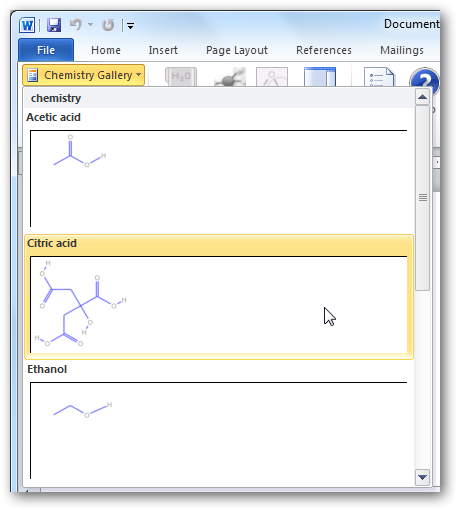 Whether you’re a professional chemist, just taking chemistry in school, or simply curious about the makeup of Citric Acid, this add-in is an exciting way to bring chemistry to your computer. This add-in works great on Word 2007 and 2010, including the 64 bit version of Word 2010. Please note that the current version is still in beta, so only run it if you are comfortable running beta products. 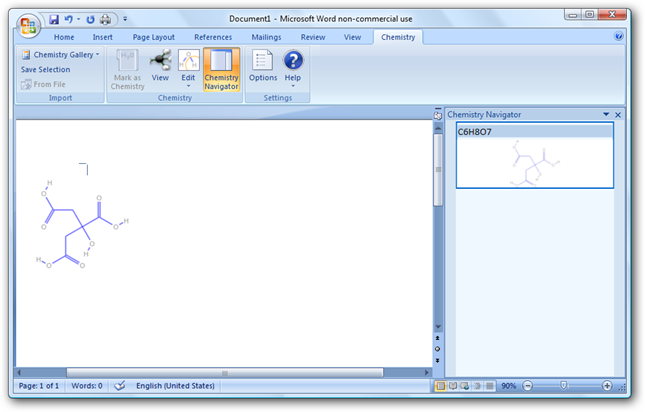 Download the Chemistry add-in from Microsoft Education Labs (link below), and unzip the file. 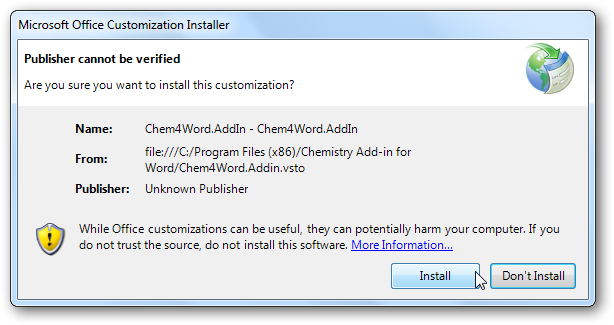 Then, run the ChemistryAddinforWordBeta2.Setup.msi. 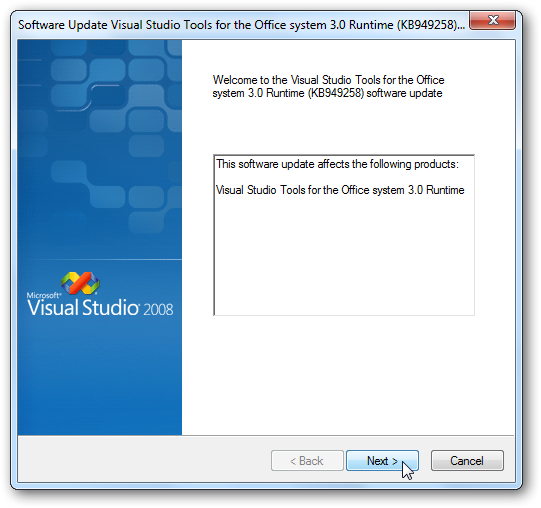 It may inform you that you need to install the Visual Studio Tools for Office 3.0. Simply click Yes to download these tools. This will open the download in your default browser. 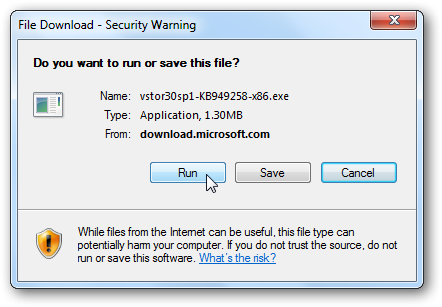 Simply click run, or save and then run it when it is downloaded. Now, click next to install the Visual Studio Tools for Office as usual. When this is finished, run the ChemistryAddinforWordBeta2.Setup.msi again. This time, you can easily install it with the default options. 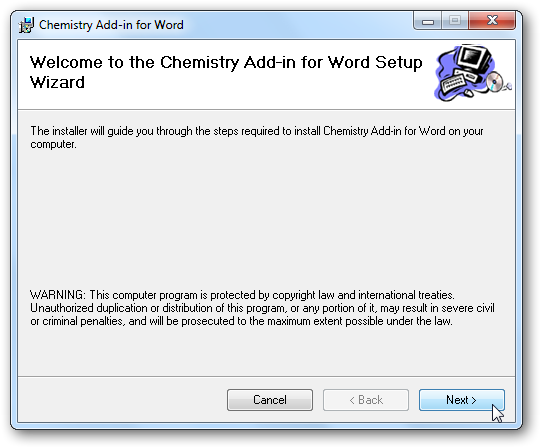 Once it’s finished installing, open Word to try out the Chemistry Add-in. You will be asked if you want to install this customization, so click Install to enable it. And here it is in Word 2007. Or you can insert a formula from file. 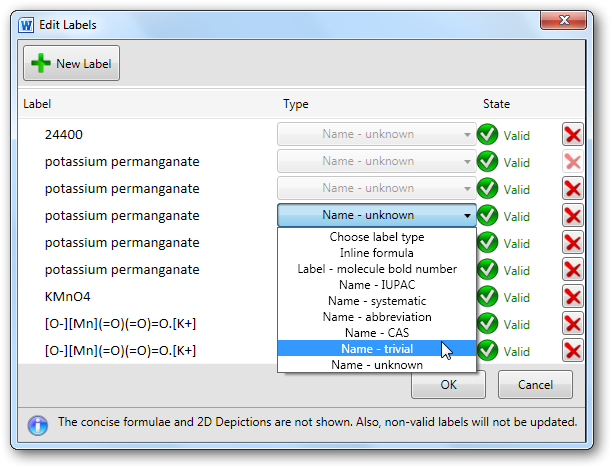 Simply click “From File” and choose any Chemical Markup Language (.cml) formatted file to insert the chemical formula. You can also convert any chemical name to it’s chemical form. 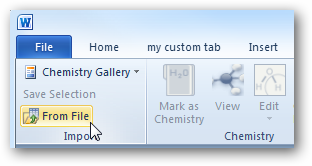 Simply select the word, right-click, select “Convert to Chemistry Zone” and then click on its name. 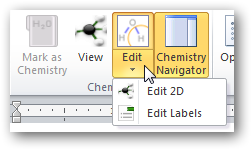 Now you can see the chemical form in the sidebar if you click the Chemistry Navigator button, and can choose to insert the diagram into the document. 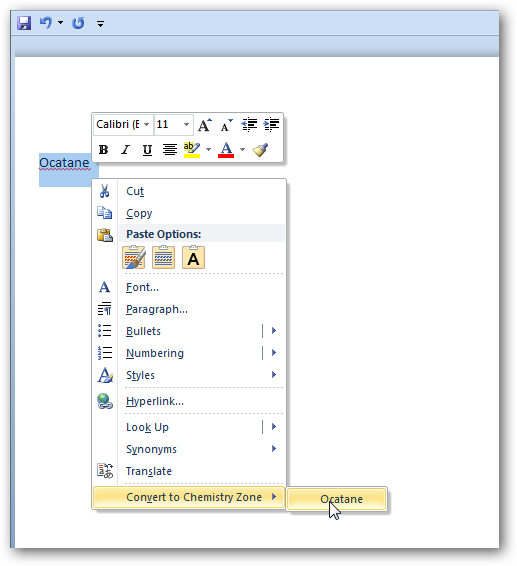 Some chemicals will automatically convert to the diagram in the document, while others simply link to it in the sidebar. Either way, you can display exactly what you want. This directly converted it to the diagram directly in the document. 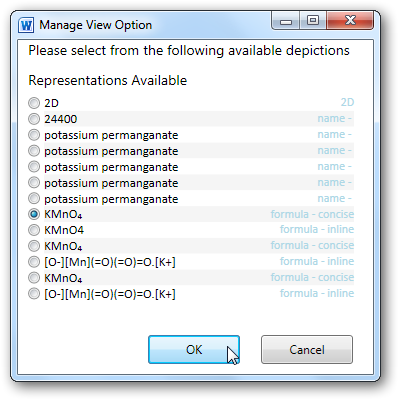 You can click the Edit button on the top, and from there choose to either edit the 2D model of the chemical, or edit the labels. You can then edit the names and formulas, and add or remove any you wish. If you choose to edit the chemical in 2D, you can even edit the individual atoms and change the chemical you’re diagramming. 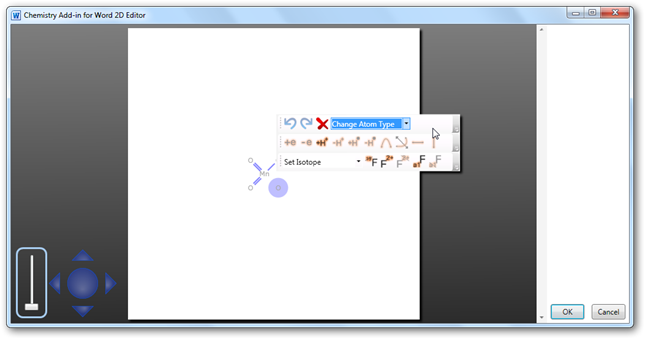 This 2D editor has a lot of options, so you can get your chemical diagram to look just like you want. 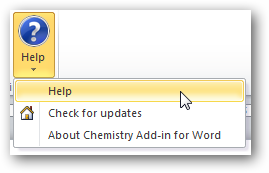 And, if you need any help or want to learn more about the Chemistry add-in and its features, simply click the help button in the Chemistry Ribbon. This will open a Word document containing examples and explanations which can be helpful in mastering all the features of this add-in. All of this works perfectly, whether you’re running it in Word 2007 or 2010, 32 or 64 bit editions. Whether you’re using chemistry formulas everyday or simply want to investigate a chemical makeup occasionally, this is a great way to do it with tools you already have on your computer. It will also help make homework a bit easier if you’re struggling with it in high school or college.